NASA's Vehicle Assembly Building is shown under construction in this view taken on Jan. 5, 1965 in Cape Canaveral, Fla., at the Kennedy Space Center. Complex 39 was NASA’s moonport. It was constructed between 1961 and 1966. The Vehicle Assembly Building, shown here under construction on Jan. 5, 1965, was huge — nearly twice as big as the Pentagon and 525 feet tall, just shy of the height of the Washington Monument. The whole setup was too big for Cape Canaveral’s 17,000 acres. Sites in Hawaii, Georgia, the Bahamas and off the California and Texas coasts were considered. Ultimately officials chose this location on Merritt Island, next to the Cape Canaveral facilities. 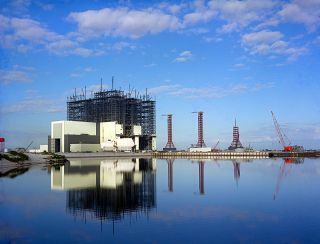 In this historical photo from the U.S. space agency, a reflection of the Complex 39 Vehicle Assembly Building (VAB) is visible, along with the Launch Control Center (LCC) and Service Towers as seen from across the Turning Basin.